Algae are promising long-term, sustainable sources of biomass and oils for biofuel, feed, food, cosmetics and pharmaceuticals. 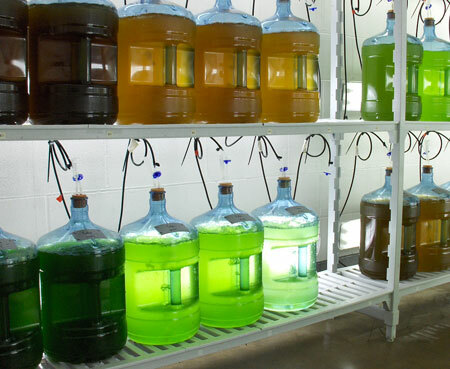 SMARTAQUA will use algae to support the development of more sustainable, fortified fish diets and other non-food products, including dyes, pigments and bioactive compounds. Marine fish meal and fish oils are commonly used in aquaculture feeds (aquafeeds) largely due to their high content of high-quality proteins and beneficial omega-3 long chain polyunsaturated fatty acid (n-3 LC-PUFA). However, the natural supply of marine fish is finite, and there are already signs that aquaculture is placing a high burden on wild fish resources, as it consumes 68% and 88% of the yearly global supply of fish meal and fish oil, respectively. Due to the decreasing supply and raising prices, alternative raw materials are being used in the formulation of aquafeeds. Amongst such alternative aquafeed ingredients, micro-algae offer some of the best alternatives to fish meal and fish oil derivatives. SMEs in Wales are in direct competition with large, international aquafeed companies. The production of novel fortified fish diets using microalgae will place Wales in a stronger position in a rapidly growing sector. However, to get their products onto the market, there needs to be rigorous testing of novel aquafeeds and nutraceuticals, and SMARTAQUA will provide this. Find out more and join our network of eco-innovators in the non-food aquaculture industry.